I would like to enter your photo contest but how do people who live in rural areas enter... We get our mail delivered to a P.O. Box. Anyway here it goes. I have a 7 week old pup. He is at home now as of Dec. 17th. The picture I am sending is a pic. when we went to see the pups at 5 wks old. He has grown a lot in 3 weeks now. Not getting much sleep with a new baby in the house. He is great and I love him. We named him Diesel. Anyway, good luck with your baby and I hope you get some sleep soon. Keep the pictures coming in. First, I want to say Congratulations on your new addition, there is nothing better than having a puppy. Enjoy this time, it is so precious regardless of the work of potty training etc. This is the bonding time and that little puppy is just full of love and playfulness. I got my beautiful Mia when she 12 weeks old and now she is 2 yrs old, where did the time go. 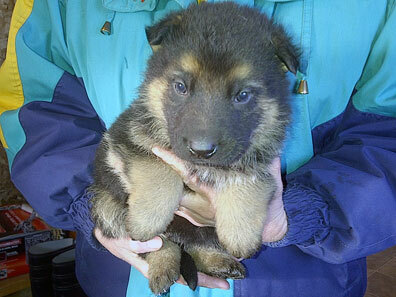 Your Diesel will grow strong and he will be your protector - that what German Shepherds do, it is in their blood. Take care of your boy and he will take care of you!